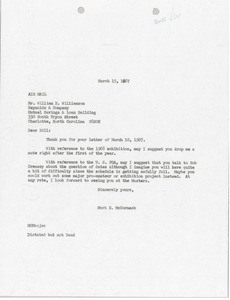 Cleveland (Ohio) - McCormack gives Williamson advice on a potential 1968 golf exhibition and suggests contacting Bob Creasey about a U.S. PGA date. 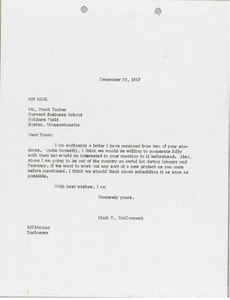 Cleveland (Ohio) - McCormack writes regarding letters received from students and he mentions meeting with Tucker about new projects. 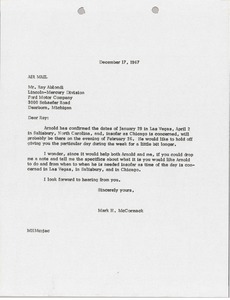 Cleveland (Ohio) - McCormack informs Thornton that there are currently no job openings within Arnold Palmer's organization. 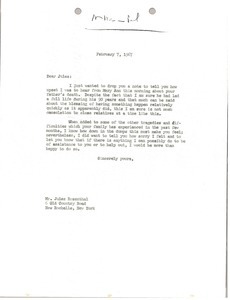 Cleveland (Ohio) - McCormack send his condolences on the death of Jules Rosenthal's father, Norman Horowitz. 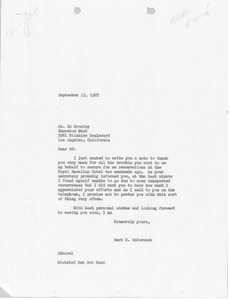 Cleveland (Ohio) - McCormack expressing his gratitude for Crowley's help in making reservations at the Royal Hawaiian Hotel which he was never able to use. 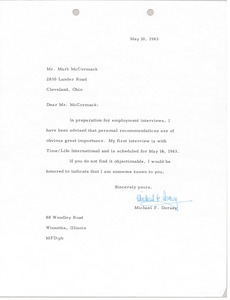 Cleveland (Ohio) - Dorsey is interviewing with Time/Life International and asks to use McCormack as a personal reference. 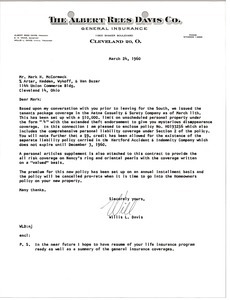 Cleveland (Ohio) - Letter regarding McCormack's personal property and personal liability insurance coverage. 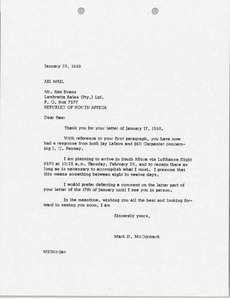 Cleveland (Ohio) - McCormack mentions J.C. Penny, his upcoming trip to South Africa and Evans' recent letter. 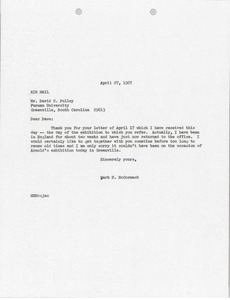 Cleveland (Ohio) - McCormack apologizes for being away and not receiving Pulley's letter until that day.